Il Ponte, Millennium Seoul Hilton’s popular Italian trattoria, will host a special promotion featuring delicious mushroom creations. Throughout the month of August, a special mushroom-themed five-course meal will be offered, priced at KW110,000 per person. Enjoy this opportunity to savor the earthy and irresistible flavors of various mushrooms in delicious Italian dishes. The meal will commence with a champignon mushroom and tomato carpaccio with rucola salad, followed by a cream of mushroom soup with truffle essence. Next, the diner will enjoy a mushroom and asparagus risotto flavoured with thyme. 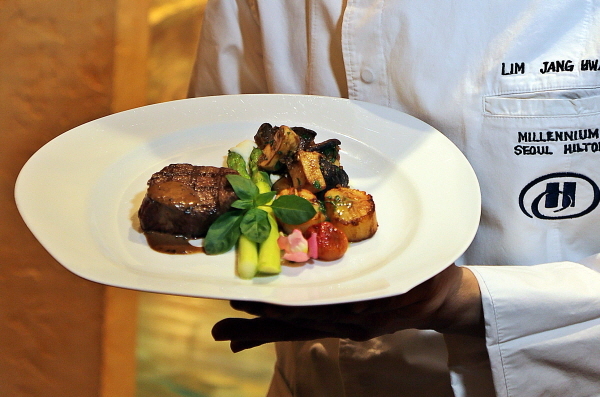 The main showcase will be grilled beef tenderloin with pan-fried sea scallops served with wild mushroom and butter-poached vegetables. The dessert will be a cappuccino cheesecake with berries compote. Enjoy this opportunity to indulge in the captivating aroma of mushrooms cooked with Italian flair!